6th Edition Florida Building Code, Energy Conservation, based on the 2015 IECC, referencing ASHRAE Standard 90.1-2013 with Florida specific amendments. 2017 Florida Building Code, Energy Conservation (FBCEC), based on the 2015 IECC. The Florida Building Commission (FBC) is directed to adopt, revise, update, and maintain the Florida Building Code in accordance with Chapter 120 of the state statutes. The code is a mandatory uniform statewide code and need not be adopted by a local government to be applicable at the local level. Local jurisdictions may not adopt more or less efficient codes. Visit the Florida Building Commission FAQ page for a detailed overview of the code modification process. Technical Advisory Committee Review Process (from previous code update). Three year code cycle. Please see this presentation for more information on Florida’s system for updating its codes. July 20, 2016 The Energy Rating Index (ERI) Workgroup meets for the first time in Gainesville. This group is charged with determining the role of onside renewable power generation in code compliance and providing a report to the Florida Building Commission. June 30, 2015 The 2014 FBCEC, based on the 2012 IECC, becomes effective. Language stating that the statewide uniform code shall not be made more stringent or lenient by local government has been deleted. The 5th Edition of the FBCEC separated the residential and commercial portions into two distinct, separate, stand-alone “codes.” Both residential and commercial scopes were revised to include building sites in addition to systems and equipment associated with buildings and building sites. Read the full analysis of the 2014 code here. January 1, 2015 The 2014 FBCEC, based on the 2012 IECC, is passed. March 15, 2012 The first printing of the 2010 Florida Building Codes, including the now-separate document 2010 Florida Building Code, Energy Conservation, become effective. Adopted by the Florida Building Commission in 2011, the state-developed code claims the 2009 IECC as its base document, with significant Florida-specific changes integrated throughout. Read more about the changes in this code here. The FBC estimates the 2010 state code is 5% more efficient than the 2007 FBC edition, or roughly 20% more efficient than the 2006 IECC. The changes to the 2010 code have been outlined in an FBC presentation. Beginning with the 2010 Florida Building Code, building efficiency requirements are to be based on the IECC, which by law must be amended to be no less stringent than the requirements of the Florida Energy Efficiency Code for Building Construction. April 2011 The development process for the 2010 Florida Building Code moves into the 45-day “glitch cycle” comment period. Glitches are proposed alterations to the current code that were submitted earlier during the development process and must meet certain criteria before being considered. The Commission plans to hold hold a rule adoption hearing on June 7 to fix any technical glitches in the draft 2010 FBC. August 2010 As part of the 2010 Florida Building Code update, the Florida Building Commission moves to completely revise the Florida Energy Efficiency Conservation Code using the 2009 IECC as the foundation code. The Energy Technical Advisory Committee (TAC) meets and and takes actions on 107 proposed code modifications. March 1, 2010 The proposed code amendment cycle commences. A public comment period is scheduled for approximately April 3 to April 25. March 1, 2009 After being postponed several times, the 2007 Florida Building Code finally becomes effective. According to a report by the Florida Solar Energy Center, the 2007 FBC would likely result in new homes that are about 17% more efficient than homes built to the standards of the 2006 IECC and about 3% less than the 2009 IECC. February 29, 2009 The Florida Solar Energy Center, tasked with assisting in the development of the new state rule for a cost effectiveness test of the Florida Building Code, releases a report, Energy Efficiency Cost Effectiveness Tests for Residential Code Update Processes. June 17, 2008 Florida Governor Charlie Crist signs HB 697, which outlines the state legislature’s mandates to improve the energy performance of Florida’s infrastructure. To meet the state’s ambitious energy efficiency goals, the Florida Building Commission shall select the most current version of the IECC as a foundation code. The law also directs the Florida Building Commission to include provisions in the 2010 edition of the Florida Energy Efficiency Code for Building Construction necessary to increase the energy performance of new buildings by at least 20 percent as compared to the energy efficiency provisions of the 2007 Florida Building Code adopted October 31, 2007. Further scheduled provisions shall increase energy efficiency by 30, 40, and 50 percent compared to the 2007 Florida Building Code for the 2013, 2016, and 2019 editions of the Florida Energy Efficiency Code for Building Construction, respectively. July 13, 2007 Governor Crist issues an executive order directing the Florida Building Commission to amend the Florida Energy Efficiency Code for Building Construction to increase energy efficiency requirements for residential and commercial buildings by 15%. 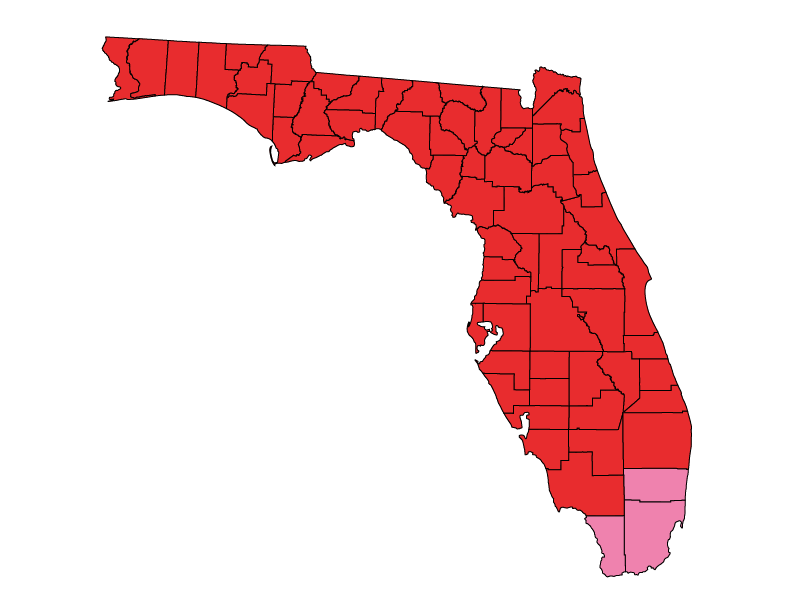 1980 Florida becomes one of the first states in the US to adopt a statewide mandatory energy code. Florida has been a leader in establishing requirements for the performance of central forced air space heating and cooling systems and controlling air infiltration due to air pressure balance between indoor spaces. It has focused on balancing building energy efficiency with indoor air quality priorities for its hot and humid climate. Historically, Florida has maintained its energy efficiency requirements equal to or greater than the benchmark national standards as certified to the US Department of Energy over the past 20 years.